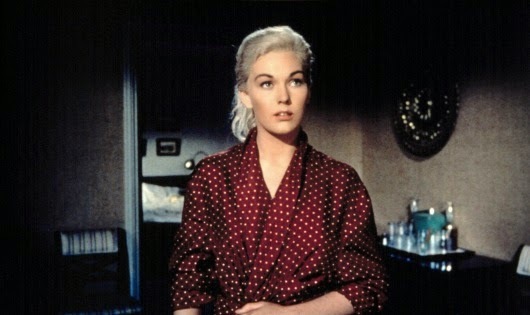 VERTIGO was not well-liked upon its initial release, but now is recognized as a classic Hitchcock film and one of the defining works of his career. It’s also regarded as one of the great films of all time by a majority of critics. It’s amazing that Hitchcock inspires such strong feelings, both good and bad almost thirty years after his death. Here is a link to a short video by A.O. Scott about the enduring appeal of VERTIGO. 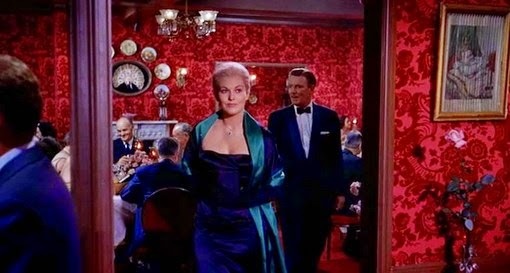 Whenever I teach, I talk a lot about VERTIGO—particularly Hitchcock’s use of design and color elements; the repetitive patterns, in its blocking, in its framing, and its score; and the use of the intrinsic physicality of his two leads, James Stewart and Kim Novak. Hitchcock said, “The actor must be an element [of composition] because film is montage. But I do explain the cutting to him so he knows why I’ve asked him to cooperate.” To me, this is one of the most important aspects of directing actors, yet as far as I can tell, one of the most under-utilized. Though one wants an actor to feel at ease and unselfconscious in a scene, I find that it’s helpful if he or she understands what I’m trying to accomplish in terms of the pieces of the scene. (I should add here that there are many directors, actors, and acting teachers who would disagree with me about this approach. But I find that a lot of young actors grasp the value of it very quickly. Perhaps it’s because they are part of a generation that has been raised on computers, and therefore they get onboard with the idea of thinking in a non-linear manner.) Hitchcock also said, “You can do anything you want with montage. 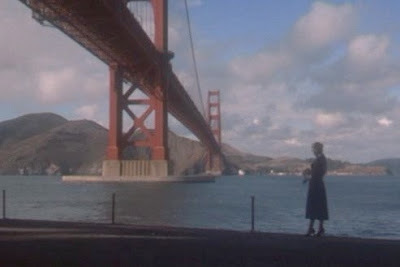 Cinema is simply pieces of film put together in a manner that creates ideas and emotions.” VERTIGO is an amazing piece of work in terms of how little the dialogue matters to one’s experience of the film. Actually much of the dialogue feels dated, and more than a little ham-fisted (on the most superficial level, the plot is ridiculous), but the impact of the film’s visuals doesn’t feel dated at all. 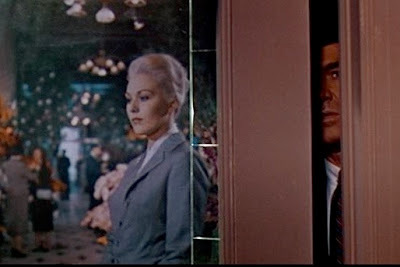 The power of seeing Kim Novak as Madeleine, moving across a room towards James Stewart, three different times in the film, on exactly the same axis, in exactly the same framing, creates an enormously potent motif that reinforces its themes. She’s presented over and over to the viewer in a manner that reinforces the character Scottie’s first and enduring experience of her, and the moment is always treated as dream-like. She moves slowly and artificially—she seems unreal, because ultimately she, the character, is unreal. My favorite shot in the film is the long dolly shot that introduces Madeleine. The camera begins on Scottie, seated at the bar, looking over his right shoulder. The restaurant is full and noisy. The camera moves off him and tracks to the left until it comes to rest on a shot of the entire dining room. Then ever so slowly, like a dream, the sounds of the restaurant drop away and the score begins as the camera slowly tracks in towards Madeleine, with her back towards us. We know who we should be looking at because of the positioning of her body in the frame—she’s posed elegantly, like a painting. Her bare back is exposed, drawing our eye like a magnet. It’s not Scottie’s POV—instead it’s an objective shot that identifies the audience with Scottie. It’s as though Hitchcock is saying, “I want you, the audience, to become as fascinated with this woman as the protagonist is about to become.” For me, it’s masterful filmmaking. And it’s indicative of a mind that understands the power of the dynamics of montage–when to make the shot subjective, when to make the shot objective, and how the difference will affect the audience. The film tracks Scottie’s obsession with Madeleine, piece by piece—his attention and the viewer’s are simultaneously directed towards the specifics of her hair, wardrobe, shoes, jewelry—in such a way that one could turn the sound down entirely and know exactly what Scottie is thinking. Madeleine is frequently shot in profile, reinforcing the idea of Madeleine as an Apollonian ideal (i.e. the idea of imposing an illusion of order on the chaos of the universe). 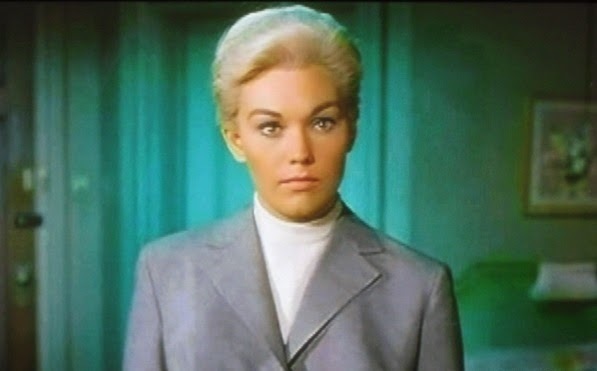 Mirrors are also used throughout the film to reinforce the idea of the ephemeral quality of our ideals, the projected image, and the dual nature of the Madeleine/Judy Barton character. The film is stunning in how much it evokes a universal experience of projecting onto a romantic “other” our own ideas of what we want that “other” to be. It captures the sense of how we unconsciously try to duplicate an experience that was meaningful for us, in spite of what it costs us in ignoring the pleasure of a present experience. The tragedy of the film reflects the tragedy of the human condition, when one is unwilling to accept what actually is and to let go of the past. I think that is probably why the film continues to endure, and warrants repeated viewing. It presents an opportunity to ponder one’s own romantic illusions and one’s present choices. “…It’s clear that what we have in the works of Hitchcock really is, despite the ups and downs of the quality of the films, a giant oeuvre — one huge imaginative projection. I feel also that Hitchcock’s vision is so extensive, so broad, that it takes in everything, from architecture to politics to sexuality — but sexuality in particular, with its weird mixture of beauty and desire and horror and the macabre. There’s an emotional depth to Hitchcock’s films that I find almost completely lacking in some of the European art films that I once so adored and now regard as rather affected and very partial statements about human life…. I think every young filmmaker should be studying Hitchcock because of the editing alone–that is, the economy with which an enormous amount is compressed into three seconds of an image. Today I can barely stand to watch most new films that are released, even the ones that are critically praised, because they run on and on and on. The people who make them have no sense at all of subtlety and suggestion and how to think about a shot, to set it up months in advance in your head and not just fall to the lowest common denominator of the audience. Hitchcock had such a keen sense of the popular audience — which I think he got from his lower-middle-class background and from watching the crowds in London. He’s able to go directly to the mass audience and yet never insult that audience. He plays tricks on us, but with the most incredible kind of sculptured cinema. It’s pictorial insofar as he imagines the screen as if it’s a painting and fills up the rectangle, but it’s also sculptural in the way that he photographs the human figure. The great stars of Hitchcock look like monumental objets d’art; they are just wonderful to look at.